But consider this: Stanton Friedman has long paraded a basketful of heavily redacted declassified government agency files about UFOs as evidence that freedom of information simply does not apply to this subject, and that Western governments continue to keep a cupola-shaped lid on it. To my knowledge, Wikileaks et al have not managed to acquire, or publish, the full versions of said files - even though knowledge of their existence is already in the public domain. Given the kinds of other sensitive materials they have sourced and released down the years, I find this surprising - and also illuminating. This kind of material is clearly buried very deeply, and remains highly sensitive despite the passing of many decades. Why is that? There is a misperception generally of the efficacy of government secrecy, which this book goes some way to address. In the light of this consideration, the fact that this book (like so many UFO books) tends to concentrate upon the events in the decades following the Second World War is both a strength and a weakness. A strength because the history of the UFO subject is now so old that there seems very little reason why any kind of information restriction should still be applied to it by government. Sensitive intelligence sources are now dead, their gathering methods well known, the technology of the time is now obsolete, and the politics forgotten. A weakness because we've heard it all before, many times. Yes, diligent researchers like Friedman and Marden continue to unearth new materials from archives, but really the story has remained largely the same for many years. So, what is there that is new here? The authors have unearthed archive material that provides corroboration supporting prior suspicions that some prominent UFO sceptics and debunkers had strong connections with intelligence agencies. A whiff of conspiracy in officialdom - who'd have thunk it? In a way, that is unsurprising given the time period in question, when physicists were sequestered into the armed forces, and naturally had their talents put to good use in intelligence and classified government research. But there is then clearly an issue of partiality and bias on the part of these same civilian scientists commenting upon UFO secrecy or, indeed, running the defining panels of investigation! In this regard, the authors go into some considerable detail in the cases of Drs Edward Condon and Donald Menzel, whose evident bias against the subject could be seen as part of a wider strategic intelligence game. The case of Philip Klass seems less determined by his government connections, and more an instinctive attack dog attitude on his part towards a subject that he had made his mind up about very early on. 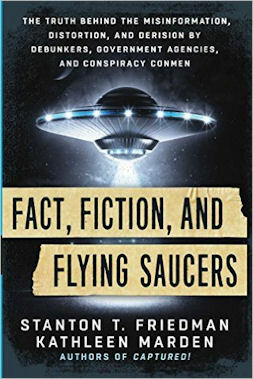 In looking back at the contributions made by these men to destroy the legitimacy of UFO research, one can't help but sense Stanton Friedman's professional pleasure at getting the last word. Perhaps he also misses the cut and thrust of the debates he once had in a subject which has, in recent years, become over-sensationalised by an Internet medium which has no time for such matters as evidence, fact-checking, thoughtful consideration. Even so, he's still taking a pop at old sparring partners, long since gone. To some extent, who can blame him? Men such as these wrongly imparted tremendous damage not only upon the genuine scientific merits of many UFO reports, but also on the reputations of many of their earnest protagonists, and truthful experiencers. They had a job to do, and the collateral damage they inflicted was no doubt justified on the grounds of National Security. And still is, I'm sure, although the job these days must be made considerably easier by the distinct lack of flying saucer activity in recent decades (a great shame, given the almost universal availability of high definition video cameras carried about by just about everyone). Which brings the authors to the subject of just why it was that the 40s, 50s, 60s saw such remarkable UFO flaps in the first place? Following on from the excellent work of Robert Hastings, they settle upon the rise of nuclear technology and armaments as the focal point of the extraterrestrial interest in our backwater affairs. Seems ever more plausible as we look back on those heady Cold War days, and note the crucially important UFO activity concentrated around sensitive government nuclear installations and test sites. In the light of the sheer destructive power capable of being brought to bear at a moment's notice, this seems to make sense. Even more so when one considers the occasions when UFO activity coincided with lockdowns in missile silos. It's true that the nuclear issue still exists today, but the passage of time has dulled the novelty factor (and provided (false?) confidence that it'll never happen); aided by our dismal efforts to maintain momentum in our 'conquering' of space (a misnomer if ever there was one). Perhaps we are not perceived as being the threat we once were. Humanity's playful experiment with nuclear war has peaked and receded slowly with the passage of time, and so, perhaps, has external interest in some of our more alarming activities. That said, it would be interesting to learn whether there has been an uptick in UFO activity in North Korea and Iran in recent years? But, then, how could we ever know? Another group whose interest has flagged (if, indeed, it ever showed much in the first place) is academia. The authors argue that if relevant cases are not written about in the kinds of peer-reviewed journals that academics read, then they might as well never have happened. The authors then cite the difficulties published academic researchers have in getting papers published that even have a sniff of UFO evidence in their contents. It's a self-perpetuating vicious circle, aided by a media which is happy to distort a reasoned study into disparaging hyperbole, potentially damaging reputations. Rarely, if ever, are the genuine scientific investigations of yesteryear properly cited by an ignorant media, or by dismissive naysayers from the comfort of their armchairs. It's also a fine point that a great deal of scientific research in fields aligned with UFOs (like cutting edge foreign technology, aerospace research) takes place within the classified sphere where reports are simply unavailable for broader academic scrutiny. Those classified research arenas are vast, and employ a great many scientists whose overriding loyalty necessarily lies with their employer - the government, or aligned monolithic private sector companies. "Two different academics told Friedman that if Roswell had really happened there would have been a need to pull many physicists from their academic positions to investigate. This totally ignores all the scientists working in industry and at the national laboratories such as Oak Ridge, Los Alamos, Livermore, Sandia, Hanford and so forth, all of whom require security clearances. A recent check showed that the total budget that year of the three nuclear weapons labs... was greater than the total expenditure of the National Science Foundation on all its research grants. The authors cite the best scientific evidence available in the public domain (including the wealth of good UFO data in the often neglected 'Project Blue Book Special Report Number 14"). They're also quite prepared to do a bit of debunking of shoddy Ufology themselves. I was unaware of the dodgy - even criminal - activities some well known researchers are now known for. The authors differed in their opinions about Colonel Corso (I'm inclined to agree with Marden (pp184-6)), and perhaps underestimate the useful cover provided by Bob Lazar's non-existent academic record (p188). After all, a talented mechanical engineer doesn't need to have academic credentials to prove it - he may just be very good at what he does. His maverick nature may prove an advantage if word ever got out. They also discuss some important cases in depth, particularly those Friedman or Marden were involved in. There's an element of staking a claim to various historical cases, I think, but it's natural to want to do so after so many years of diligent, painstaking research. In the end, Friedman does appear to be the last man standing (p52) - and long may he continue to do so! Subtitled "The Truth Behind the Misinformation, Distortion, and Derision by Debunkers, Government Agencies, and Conspiracy Conmen"